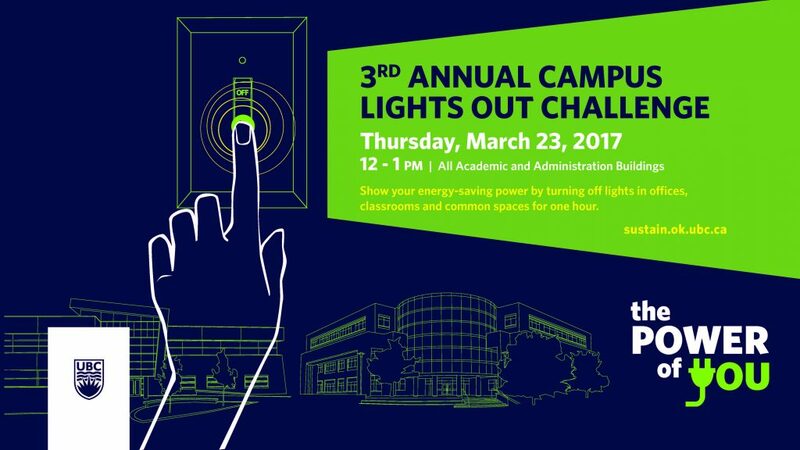 In support of 2017 Earth Hour, UBC Okanagan is hosting a campus one-hour Lights Out Challenge to support our Power of You “Lights Out” initiative on Thursday, March 23 from 12-1pm. Which building will show the greatest energy reduction during the one-hour challenge? Or have the most occupant participation? Participate on March 23 and watch the for updates to find out! Results will be posted on the Power of You website following the initiative. Where: All Academic and Administration Buildings. Action: Turn off lights in unoccupied individual and common spaces: offices, classrooms, meeting rooms, washrooms, labs, etc.